Why do you need a titanium flask? Titanium is light in weight, stronger than steel and is also a metal with highly inert properties. The resulting benefits of this inert metal are: anti-corrosive, hypoallergenic to nearly all people, and absent of metallic taste or odor. 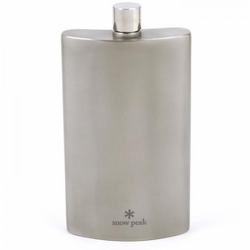 The Titanium flask is not only light enough for the most extreme ounce-counting mountaineer, but also will win the approval of the most snobby collector of Scotch. The Large Titanium Hip Flask is made out of the finest Grade A Titanium. It weighs in at 2.7oz and will hold up to six shots of your favorite liquor. Each comes cased in its own gift package including a suede carrying case and plastic funnel. Dimensions: L 5.5" W 3" H .75"